TOO FAST: Casterton Sandford’s Tom McArlein handballs ahead of West Gambier’s Jake Blackwell at Island Park on Saturday. 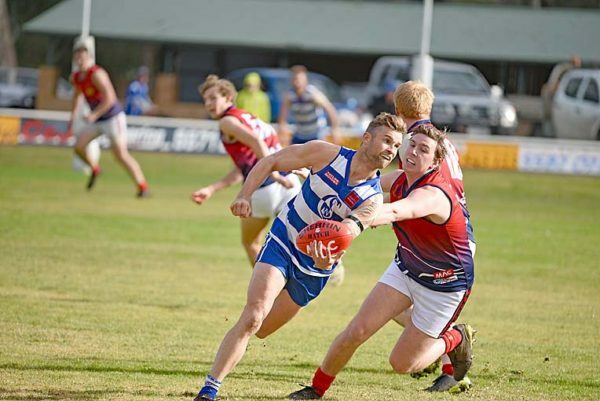 CASTERTON Sandford made its intent known on Saturday at Island Park with a solid victory over West Gambier in Round 10 of Western Border football. The Cats ran rampant from the opening bounce to the final whistle, not allowing the Roos any room to move around the ground. While West showed glimpses of good football, it was overshadowed by the Cats’ performance.